Young Ji Kim a Korean aritst bring his solo Exhibition "Truthful Energy" in Bangkok. "Immersed in Bangkok’s energetic melting pot and interacting with a group of highly diverse individuals, Korean artist Young Ji Kim attracts peoples’ brightest spirits. These spirits are captured in her works of “Truthful Energy”, where she portrays the manifestation of pure-heartedness, positivity, dynamism, and confidence of each individual. We do not find truthful energy and emotional exuberance in ordinary circumstances, but merely in environments filled with genuine love and freedom from social judgments. Young Ji innately cultivates these rare environments, which ultimately spark moments of catharsis. With the synergy between her dynamic abstract work and the human portrait, Young Ji combines these two components to exude a collaborative force that leaves a striking impression. The highly saturated colors in the background depict both the artist’s and the characters’ fearlessness in their expressions, illuminating the purity of their energies. We are left mesmerized by the radiation of emotional discharge. 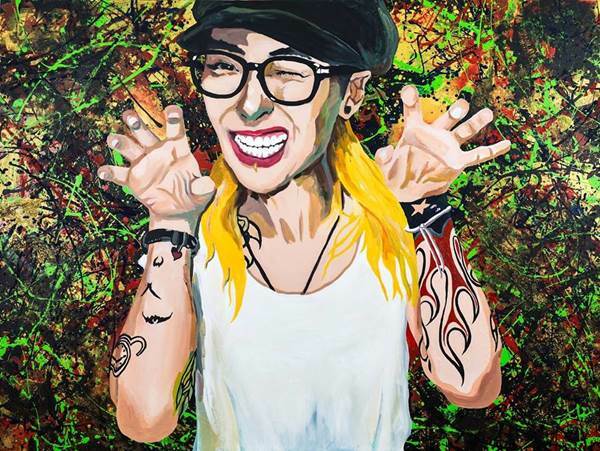 Simultaneously, Young Ji continues to explore the realm between pop and impressionist portrait styles in her work."